Peter Dickinson’s 60 Waller in 1984. Empty, but a full decade before demolition. Image: Hellmut Schade / Carleton University Audio-Visual Resource Centre. Midcentury Modern. Modernism. International Style. Whatever one’s choice term to describe the style of architecture, the road to recognition of buildings in the style as being worthy of preservation on a heritage basis has been a long one and the journey is far from over. Today, most would still take one look at the building above and fail to shed a tear over its 1994 demolition. Even among those who were present to advocate for its preservation, the arguments usually had more to do with who designed it than they did with what it was. 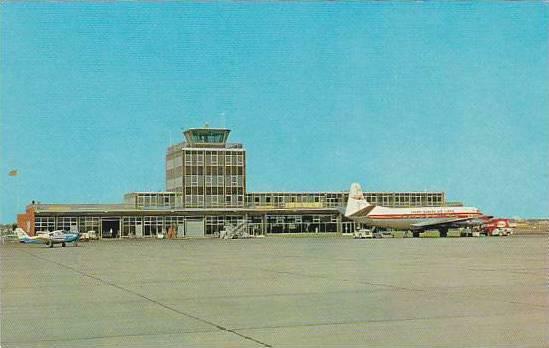 Unlike Councillor Mark Maloney (quoted in the title) I adore the airport terminals constructed during the 1950s and 1960s around Canada, including that of the Regina International Airport. Image: Wikipedia. None of this should be surprising and none of this is unique to what is my personal favourite style of architecture. For example, forward-looking Victorians were quite content to erase as much Georgian Toronto as possible. Builders in the 1920s, ’30s, and ’40s were equally as content to do away with fussy Victorian styles as Carlington-Westboro councillor Mark Maloney was to see 60 Waller demolished in 1993. Not only do architectural styles change, but they may change rapidly. As legendary an architect as he turned out to be, Peter Dickinson’s introduction to Ottawa was described as “aging” and in need of replacement less than 20 years after it had opened and did not live to see its 40th birthday.1Just as Dickinson did not. He died of cancer at 36. As it would turn out, 40 years is an important time frame when it comes to Ottawa’s downtown police stations. Ten years after completion, it became clear that Ottawa’s second city hall needed a civic companion. Image: Topley Studio / Library and Archives Canada Accession 1936-270 NPC Series TXF Item TXF-145. 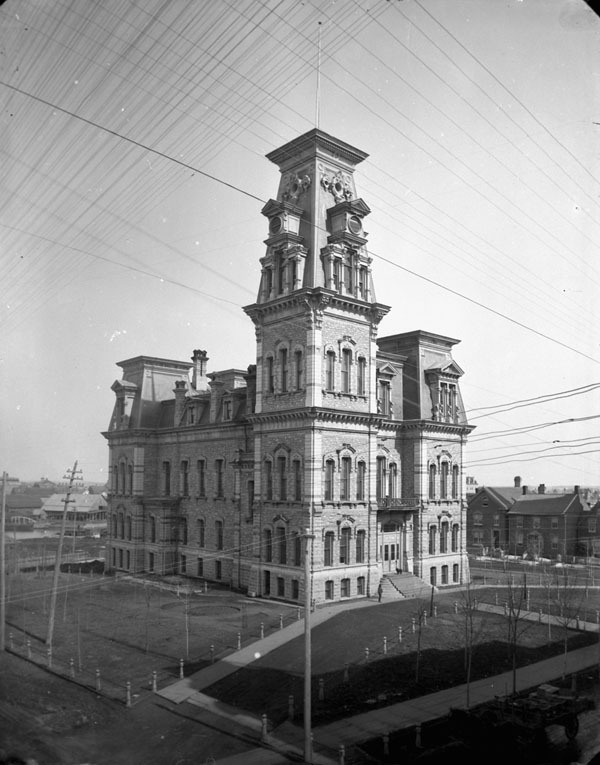 On July 13, 1888, the Ottawa Journal reported that Ottawa City Council had arrived at a decision regarding the construction of a new police station adjacent to the existing city hall, the city’s second. Designs were submitted to the competition by four architects under the pseudonyms “Baton”, “Africanus”, “Faith” and “Nepean”. After having inspected the plans and engaging in some debate, it was decided that the design submitted by Etienne Leprohon under the name of “Faith” was the best of the bunch, in spite of coming in at $14,400, or $2,400 more expensive than the advertised budget.2”The New Station,” Ottawa Journal, July 13, 1888, p. 4. Nevertheless, a new police headquarters was necessary and Leprohon’s was preferred. The existing station on the same lot was considered to be “bad, cramped, and unhealthy” and was knocked for having been constructed on a former graveyard.3”Miserable Headquarters,” Ottawa Journal, March 5, 1887, p. 1. Excavation began quickly after the winning design was announced4”City and Vicinity,” Ottawa Journal, September 12, 1888, p. 4. and Ottawa’s finest moved into the new building the following June. The basement contained 16 4×8 cells, the ground floor offices for police, and the first floor contained the court. Curiously, though council had selected Leprohon’s design, subsequent reporting credited the building’s design to James R. Bowes.5”The New Police Station,” Ottawa Journal, June 20, 1889, p. 5. A report in Canadian Architect and Builder suggests that there was some mishandling of the file and Bowes was ultimately brought in.6”Ottawa,” Canadian Architect and Builder 1, no. 11 (November 1888): 6-7. Be it James R. Bowes’ or Etienne Leprohon’s, the 1888 Central Police Station is what the Waller station was constructed to replace. Image: Public Works / Library and Archives Canada 1966-090 NPC Box T-1819 Page 14. Almost immediately, complaints were made about the station’s cramped quarters. Ottawa was a growing city and the 1887 Council’s recalcitrance resulted in a difficult situation.7In 1887, the Journal reported that most aldermen preferred to spend on road improvements. See “Miserable Headquarters,” Ottawa Journal, March 5, 1887, p. 1. Council was not much more enthusiastic in 1903 to spend, but the need for an annex building was too great and was constructed the following year.8See Ottawa Journal, March 16, 1903, p. 9; Ottawa Journal, February 2, 1904, p. 6; “The Police Station Annex,” Ottawa Journal, May 13, 1904, p. 5; “Inspected New Station,” Ottawa Journal, January 31, 1905, p. 8. The new annex was, of course, little better than a stop-gap: by 1912, in spite of Ottawa’s record low crime at the time, demands were being heard for a new station.9”New Station for Police: No Action Until System of Government is Definitely Decided,” Ottawa Journal, December 4, 1912, p. 3. Less than 25 years after construction and only 8 years after construction of the juvenile annex, the Police Commissioners asked for a new building. Source: Ottawa Journal, July 17, 1913, p. 1. What began as a sort of passive whisper campaign became a full-blown request the following summer. The Journal reported that July that Magistrate George O’Keefe and Chief Alexander Ross were poised to request $150,000 to $200,000 in order to construct a new police headquarters that would be “in keeping with our position” as Dominion capital. O’Keefe and Ross were quick to point out that a number of much smaller Canadian cities have constructed considerable headquarters facilities in recent years. Chief Ross stated that “we are away behind other cities in such matters. Regina, a city with a population hardly half of that of Ottawa, recently issued debentures to the amount of $100,000 for a new police station and a signalistic alarm system.”10”New Police Station To Be Urged,” Ottawa Journal, July 17, 1913, p. 1. For its own part, the Journal’s editorial board was supportive of the demand.11”Proposed New Police Station,” Ottawa Journal, July 22, 1913, p. 6. To Police Chief Ross, Ottawa deserved a police headquarters at least as commodious as the one under construction in Regina designed by Frederick Clemesha and Francis Portnall. Source: The Canadian Builder and Carpenter, October 1914, Page 23. Long-term delay is a familiar story in Canadian urban development and construction. A large number of factors intervened, leaving Ottawa in a position that made it difficult to proceed. A recession began in 1913, the Great War broke out in 1914, the 1920s were economically “uneven” in Canada,12See Richard Pomfret. The Economic Development of Canada, Second Edition (Toronto: Nelson, 1993): 231-243; Kenneth Norrie, Douglas Owram, and J.C. Herbert Emery. A History of the Canadian Economy, Fourth Edition (Toronto: Thompson, 2008): 280-301. the Great Depression hit in 1929 and lasted until the Second World War broke out a decade later. Each of these factors diverted capital, labour, time, and attention from such civic projects, which left Ottawa’s police service in its cramped and “inadequate” quarters along Queen street at the Canal. That, of course, does not mean that there weren’t efforts to see the project through during those years. 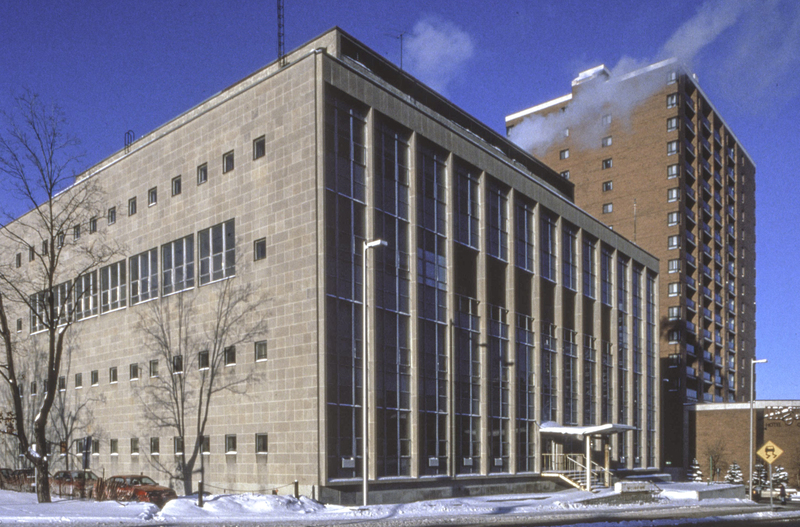 In 1937, plans were made to construct a large-scale civic complex – including a new police station – on “the old market square near Wellington.” In an editorial supporting the move, the Citizen even suggested that Jacques Gréber, “the gifted architect and planner from Paris,” was supportive of the move.13”New Municipal Center,” Ottawa Citizen, August 16, 1937, p. 24. It appears that the plan had gained some momentum, as Police Chief J.P. Downey was asked to submit a report to the Board of Control for the force’s needs that winter.14”Chief Reports on Police Station,” Ottawa Citizen, February 25, 1938, p. 7. The Citizen’s editorial board, like the Journal’s, was highly supportive of a new police station and urged civic officials to quit stalling and get working.15”Civic Delay Sometimes Costly,” Ottawa Citizen, February 26, 1938, p. 28. After some months of debate, the Board of Control recommended that a $300,000 money bylaw be submitted to the city’s ratepayers in the next election. While the Lyon and Sparks location was preferred, the City did not make it official, preferring to get official word from Jacques Gréber on his preference.16”Ratepayers Will Vote On New Police Station,” Ottawa Citizen, October 13, 1938, p. 18. Once again, the Citizen’s editors urged action and added that it was important to vacate the Connaught Place area as part of the 1927 Confederation Park agreement made with the Dominion.17”Ottawa Needs a New Police Station,” Ottawa Citizen, October 15, 1938, p. 17. When tabled at its next meeting, Council agreed to the Board of Control’s recommendation and put the question to the voters in the December election.18”Ratepayers to Vote on Police Station Removal,” Ottawa Citizen, October 18, 1938, p. 16. The city’s voters were less unanimous in their support for the new facility and it was defeated.19”City Business Men Regret Defeat of Money Bills,” Ottawa Citizen, December 6, 1938, pp. 1, 4. With a ratepayers’ “no” in hand, the issue fell off the agenda. 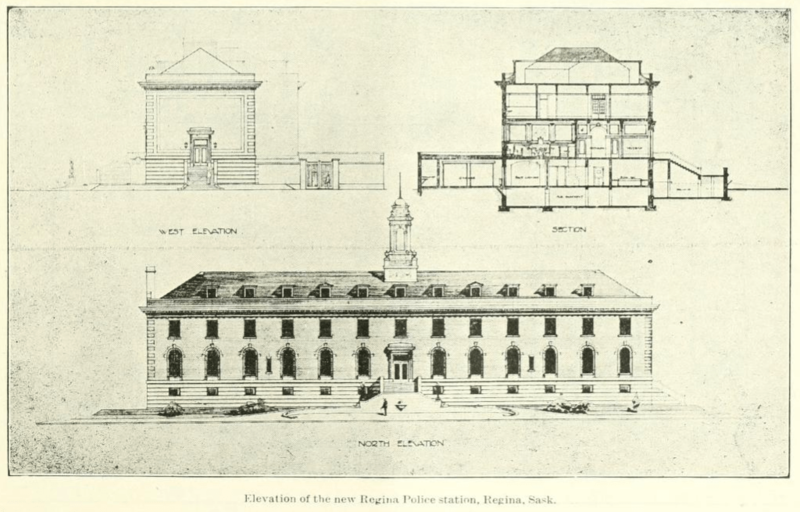 As the defeat of Hitler appeared to be in sight in late 1944, city officials began to plan for a number of projects that would need completing in the “post-war era.” Among the numerous items in the city’s backlog was, of course, a new police station, that “‘dirty old bunch of bricks on Elgin, entirely inadequate to present needs. '”20”Mayor Lewis Tells of Jobs Planned for Post-War Era,” Ottawa Journal, November 22, 1944, p. 20. The call for a new station had been reported for so long, that it made it into the Journal’s regular flashback feature.21See for example “Ottawa in 1919,” Ottawa Journal, November 17, 1944, p. 8. Excited to see the backlog taken care of, Ottawans voted overwhelmingly in favour to spend $2.5 million on various projects, including $250,000 for a new police station.22”Property Owners Approve Post-War Money Bylaws,” Ottawa Journal, December 5, 1944, p. 13. The preferred site for the new police station was on the city-owned property at Sparks and Lyon: the former uppertown market. Image: geoOttawa. 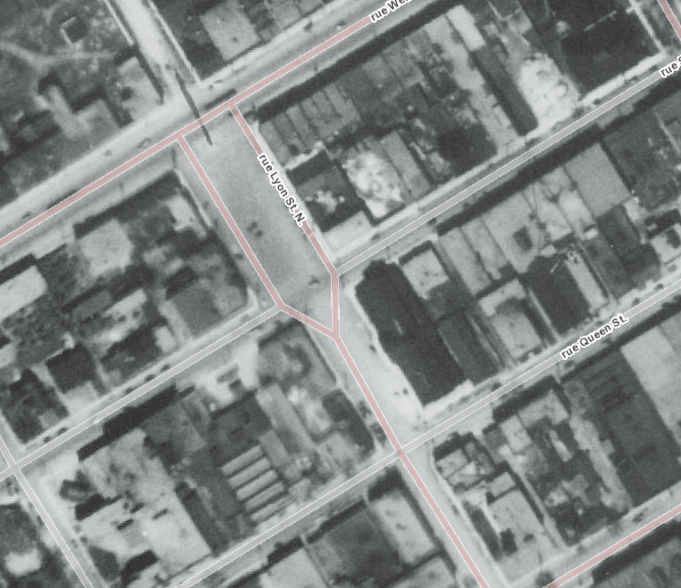 After a brief search, in June 1945, the Police Commission settled on 1938’s preferred site at Lyon street, between Sparks and Queen. As the site of the former Wellington Ward Market, the lot had the benefit of being already owned by the city.23”May Build New Police Station At Sparks and Lyon Streets,” Ottawa Journal, June 13, 1945, p. 22. Noting that discussions about a new station had been going on for more than thirty years, the Journal’s editorial board expressed relief that steps – however small – were being taken to get the issue taken care of.24”A Short Step, But Still a Step Towards a New Police Station,” Ottawa Journal, June 14, 1945, p. 8. The Board of Control approved the site the following week, though pointed out that the Federal District Commission would have to be advised as any building erected near a Dominion one “would have to be in line with the Government buildings.” In true Ottawa form, Controller Bourque mused that since it was such a large expense, perhaps the Government (Dominion) would “bear a share of the expense.”25”Board Approves Sparks Street Site For New Police Station,” Ottawa Journal, August 22, 1945, p. 18. My did he loom. 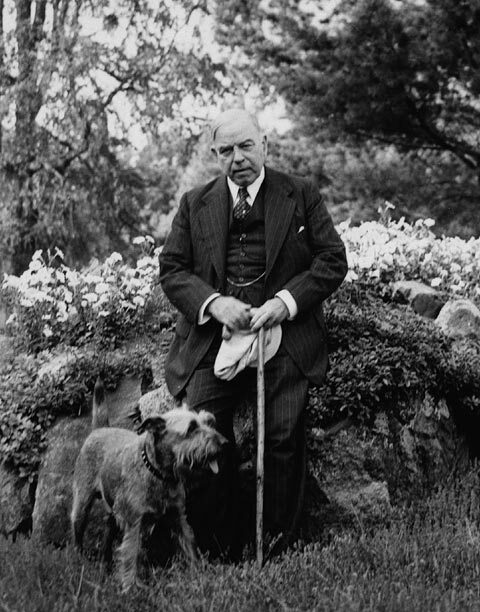 Mackenzie King and his planner Jacques Greber had definite plans for what Ottawa should look like. Image: Library and Archives Canada / C-024304. When Mackenzie King strengthened the Federal District Commission via Order-in-Council on August 17,26”Gov’t Sets Ottawa Federal District Area at 900 Square Miles,” Ottawa Journal, August 18, 1945, p. 13. a chill was sent down certain local spines. The Journal’s editorial board expressed fear that the under King’s directive no public building – namely a new police station – could be erected until Jacques Gréber’s Plan for the National Capital was complete: a delay that could be measured in months or even years.27”The New Police Station Must Not Be Held Up,” Ottawa Journal, August 31, 1945, p. 6. City officials understood that no new police station – especially one that was to be a neighbour to an anticipated Government building along Wellington – could be approved and constructed without first clearing it with the Federal District Commission. The Board of Control nevertheless hired Burgess and Gardner to go ahead and prepare plans for the new station.28”Architects Appointed To Prepare Plans For City’s New Police Station,” Ottawa Citizen, November 24, 1945, p. 8; “Name Architects to Prepare Plans for New Police Station,” Ottawa Journal, November 28, 1945, p. 22. Less than two weeks later, Controller Goodwin expressed some doubt about the Federal position on the police station and recommended setting plans aside for the time being.29”Law Injustices Blamed for Housing Problems,” Ottawa Journal, December 8, 1945, p. 4. We cannot wait, or at least we should not, until every last scheme is cut and dried before going ahead with decent provision for our police force. Time after time, in these 30 years, the project has been fanned into life, and nothing has come of it because extraneous factors were permitted to interfere. Why not a combined police and fire headquarters? Why not a police station and city hall under one roof? Will this interfere with the Government’s plans? What about a police station and court house together? What about a public hall? Is this really the best site? And couldn’t we get along a few more years with the old structure on the canal?30”Get on With The New Police Station,” Ottawa Journal, April 5, 1946, p. 4. With the decision to set the plans aside until Gréber came down from the mount with his Plan, the Journal‘s editorialists published a number of editorials and reports that expressed frustration with the delays and urged the city to proceed.31”Get on With The New Police Station,” Ottawa Journal, April 5, 1946, p. 4. 1946 stretched into 1947 and the paper quoted 33-year veteran of the Ottawa Police John Barlow reminiscing about Chief Alexander Ross confidently stating to him in 1914 that they would “get a new station in Ottawa.” The Journal, unable to help twisting the knife, added “that was 33 years ago and Ottawa still has the same building.”32”New Police Station Wanted 33 Years Ago,” Ottawa Journal, February 21, 1947, p. 13. As the Citizen‘s editorialists argued a decade earlier, delay would simply add costs to the project, and it did: in Mayor Lewis’ 1947 address, he noted that property taxes would have to be raised that year to cover the numerous large projects outstanding.33”Mayor Lewis Predicts Increase In Tax Rate,” Ottawa Citizen, January 7, 1947, p. 3. Locals seemed supportive, however. Local resident Patricia Burt was reported to have showed up to pay her outstanding parking tickets and would be happy to: so long as the money went to the construction of a new police station.34”Willing To Pay Fines To Get New Police Station,” Ottawa Citizen, April 10, 1947, p. 14. I am willing to pay any traffic fine any time if I thought the money would be used to build a worthwhile police station for Ottawa’s worthwhile police constables.35Patricia Burt, Ibid. In December of 1947 an anxious Roy Donaldson, the Alderman for St. George’s Ward, asked Mayor Stanley Lewis about the status of the project. The answer was as predictable as it was disappointing: Burgess and Gardner had been preparing plans, but without a site approved, they were yet incomplete. The Board of Control remained committed to keeping the project in abeyance until the Gréber plan was released.36”New Police Station Site Undecided Mayor Tells Council,” Ottawa Journal, December 2, 1947, p. 3. Even though the Gréber plan was released in 1950, that did not mean that Ottawa was immediately freed to put shovels in the ground. Source: Ottawa Journal, November 17, 1952, p. 4. Charlotte Whitton took over the City’s “big chair” in 1951 and it was clear from the get-go that she was not going to do business in the same way as the previous mayors on the police station file. 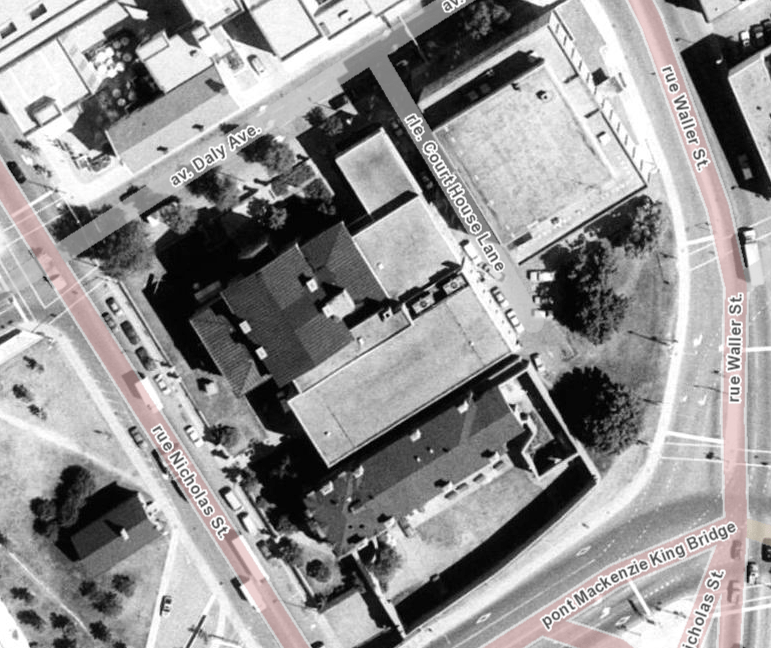 She was able to secure an agreement-in-principle in early 1952 to have the new facility located on the west side of Nicholas Street between the Mackenzie King and Laurier bridges, but by November, the file was caught up somewhere in the labyrinthine domain of the Architectural Sub-Committee. Rather than passively accept the state of affairs, she struck a meeting with Federal District Commission officials and arranged a tour of the city’s dilapidated police quarters. She “wanted everyone to see this for themselves so that my colleagues on the FDC would not think [she was] just an hysterical woman when [she] told them about the urgency of a new police station.” Although no rats were seen, Whitton was able to make her point that the situation was dire.37”FDC Planners Go on Tour Of Rat-Ridden Police Station,” Ottawa Journal, November 17, 1952, p. 4. This thing can’t wait forever while Mr. Gréber returns to Paris to consider it at his leisure under the linden trees.38Charlotte Whitton, Ibid. 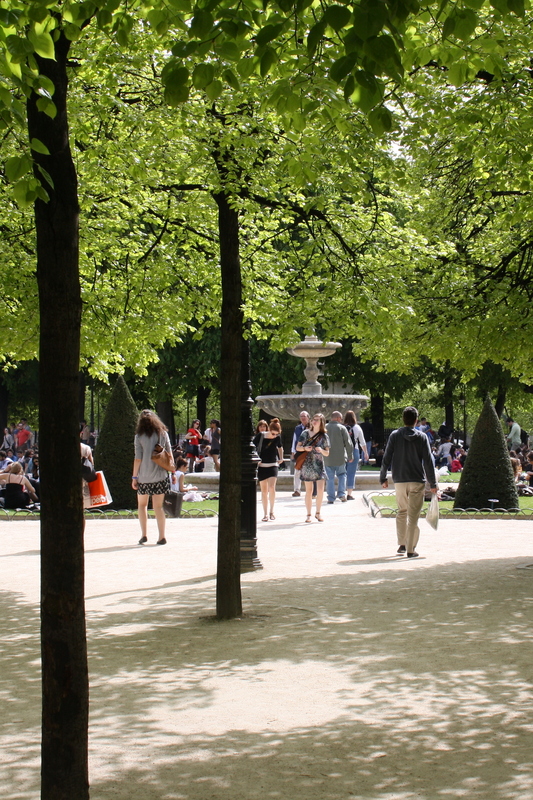 Linden trees in a Paris Park. Whitton painted an image of Gréber considering Ottawa’s police station problem at his leisure. Image: ParisShare / Flickr. Unfortunately for Whitton, it was going to take more than a tour of the police station to make the point resonate at the federal level. As the New Years’ 1953 noisemakers and crackers were being put away, the police station was put back on the agenda. On January 15, a Grand Jury submitted a report to the Supreme Court of Ontario concluding that the existing facility was not only unfit, but it was an overcrowded firetrap and should be vacated as soon as possible.39”Grand Jury Claims Police Station Unfit for Use,” Ottawa Journal, January 15, 1953, p. 34. In a Citizen editorial published on February 6, the paper urged a speedier resolution and embarrassment. It also more clearly spelled out the reasoning for needing Gréber’s blessing. Just as Controller Bourque requested in 1947, civic officials remained desirous of securing a federal contribution to the new facility. Without that detail, the City could have constructed a new station long ago.40”Ottawa’s Filthy Police Headquarters,” Ottawa Citizen, February 6, 1952, p. 34. Expressing frustration on the front page of the Journal, Charlotte Whitton neglected to mention that particular funding detail.41Ainslie Kerr. “Whitton Says Red Tape Blocks New Police Station for Ottawa,” Ottawa Journal, February 6, 1953, p. 1. While the wait continued, jail cell overcrowding resulted in additional violence,42”Police Cell Conditions Rapped After Prisoner Badly Beaten,” Ottawa Journal, March 9, 1953, p. 16. and frustrations mounted.43”Further Delay on City Hall,” Ottawa Citizen, April 9, 1953, p. 40. Editorial boards at both the Citizen and the Journal continued to sing from the same hymnal, though the latter’s had an acid tongue.44This time, it was North Bay indignant Ottawans sniffed about. “What? A New Police Station!” Ottawa Journal, August 21, 1953, p. 6. And suddenly, the skies opened up, and a lot became available. Image: uOttawa / NAPL Flight A7193 Image 34. September 16, 1944. The City gave itself a present for Christmas 1953: a site for the new police headquarters. On December 22, the Citizen reported that the city would proceed to expropriate the property adjacent to the existing Carleton County Courthouse and Jail and demolish the apartment building and rowhouses on the lot. It was one of the sites that the Civic Building Sites Committee identified and had the blessing of the Federal District Commission. Council was unanimous in approving the expenditure.45”Will Expropriate New Police Station Site,” Ottawa Citizen, December 22, 1953, p. 10. The expropriation proceedings immediately got underway and Magistrate Strike, chairman of the Police Commission, promised that construction would begin as soon as possible.46”Early Start Is Promised On New Police Building,” Ottawa Journal, April 14, 1954, p. 16. All the while, the city’s existing facility had continued to experience overcrowding. On April 24, the Citizen reported that there 30 prisoners in the jail’s 8 cells.47”There’s A Full House At The Police Station,” Ottawa Citizen, April 24, 1954, p. 3. The expropriation of the lot with the apartment building was completed in May. Réal Huot was paid $39,000 for the forcible taking.48”Expropriate Property For Station,” Ottawa Journal, May 7, 1954, p. 32; “Police Station Site Price $39,000,” Ottawa Journal, May 8, 1954, p. 3. Expropriation of the six unit row, owned by J.A. Hurteau, followed shortly after. At the same time, it was announced that the building’s design would be decided upon by an architects’ competition. The Citizen took the opportunity to quip that “if past experience is a criterion, it would be useful if the rooms were laid out so as to provide as little cover as possible for rats.”49”Police Headquarters Design,” Ottawa Citizen, May 12, 1954, p. 44. By the fall, the new site was ready to be constructed on. Source: Ottawa Journal, October 22, 1954, p. 3. Before the October 30 deadline, the city received 33 submissions to the competition. First prize was the regular commission for the $1,000,000 building and there were smaller cash prizes for the two runners-up. The contest appears to have been a popular one: C. Maxwell Taylor, the city’s building inspector, told the Journal that he received 116 inquiries about it from firms across the country.50”Architects Show Keen Interest In Ottawa Police Building,” Ottawa Journal, November 2, 1954, p. 3. Peter Dickinson’s winning design was announced on November 14. Source: Ottawa Journal, November 15, 1954, p. 26. For its own part, the Board of Control wasted no time coming to a conclusion: of the 33 designs submitted, it was Peter Dickinson’s that came out ahead. Hart Massey and Leo Drassar of Ottawa came in second, Desbarats and Affleck of Montreal in third, and Fred Lebensold, also of Montreal, in fourth.51Ottawa Journal, November 15, 1954, p. 26. The land had been cleared, the design chosen, and now all that was left was to put its construction to tenders. 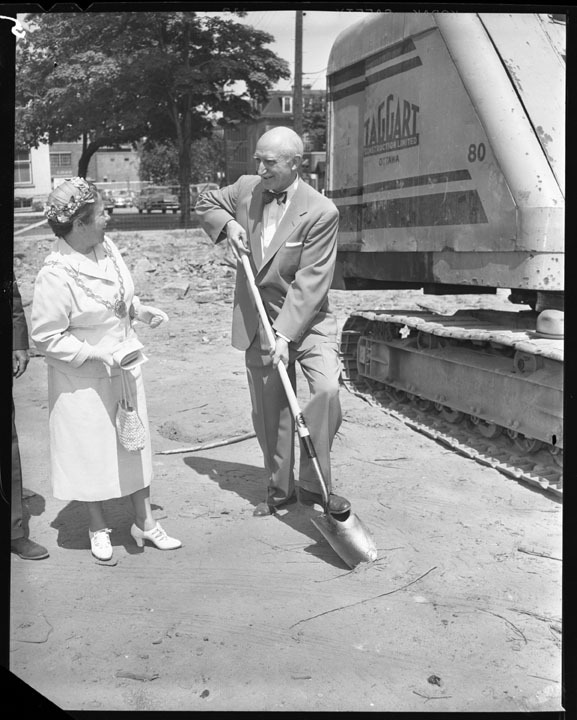 The sod-turning ceremony took place on July 20, 1955. Image: City of Ottawa Archives CA033616. At the end of the tendering process, Ross-Meagher emerged atop the pile and an official sod-turning was scheduled for July 20. Senator W. Ross Macdonald, the Attorney General of Canada accepted the invitation to do the honours and was joined by Mayor Charlotte Whitton and Magistrate Glenn Strike.52”Ross Macdonald To Turn Police Station Sod,” Ottawa Journal, July 14, 1955, p. 1. 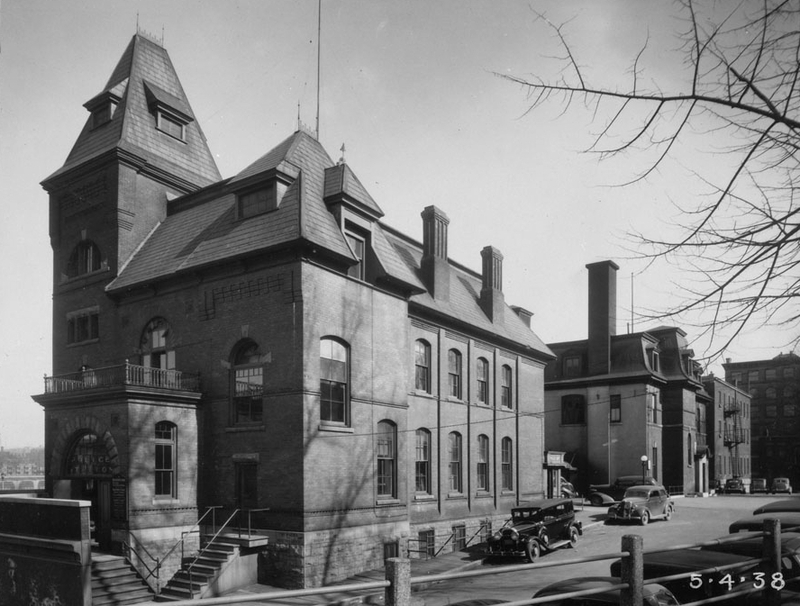 The Journal’s editors, content that the new police station was then underway, declined to let civic officials off easily, preferring to use the occasion to criticize the way the city hall file had been handled to that point. No rest for the wicked. 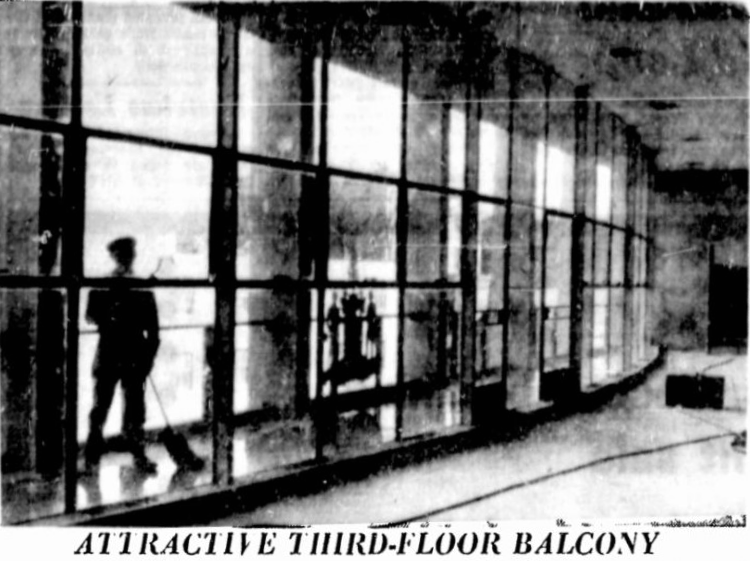 The official name for the facility was the “Ottawa Courts and Constabulary Building”.53”Fine Police Building Begun; City Offices Still in the Air,” Ottawa Journal, July 21, 1955, p. 6. Progress. August 25, 1955. Image: City of Ottawa Archives CA033957. Progress. September 8, 1955. Image: City of Ottawa Archives CA034159. Progress. September 22, 1955. Image: City of Ottawa Archives CA034384. Progress. October 7, 1955. Image: City of Ottawa Archives CA034613. Progress. December 5, 1955. Image: City of Ottawa Archives CA035731. Progress. April 27, 1956. 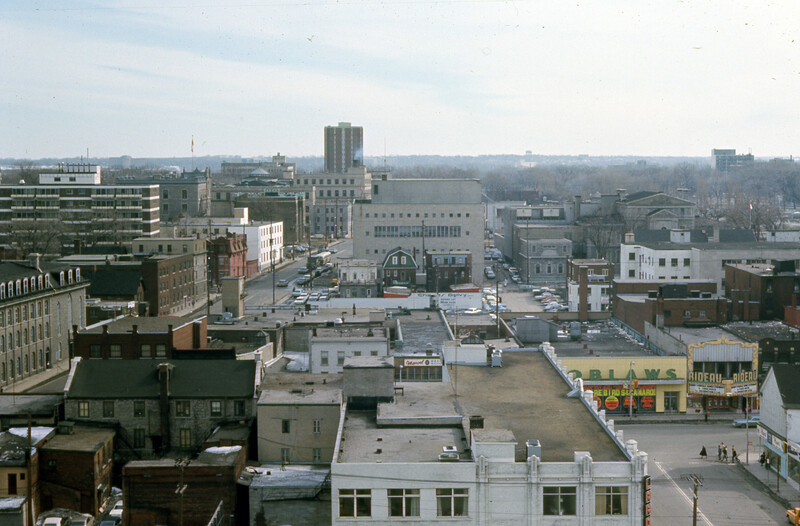 Image: City of Ottawa Archives CA038123. From there, construction progressed, largely on schedule. After having experienced a delay in having the steel delivered, Dickinson suggested that everything should be complete by October 1, though he was not sufficiently confident to say so without some qualifiers. He suggested, however, that the building’s steel skeleton would be erected by the end of April, which appears to have been the case.54”Hope To Finish Police Building By October 1,” Ottawa Journal, February 15, 1956, p. 40. With that task complete, a cornerstone-laying ceremony was scheduled for May 24.55”Lay Cornerstone New Police Building,” Ottawa Journal, May 24, 1956, pp. 1, 2. Cornerstone ceremony, May 24, 1956. Pictured is Judge Gordon McDougall. Image: City of Ottawa Archives CA038619. Cornerstone ceremony, May 24, 1956. Image: City of Ottawa Archives CA038615. As this was the culmination of more than 40 years of effort, a steel box containing the building’s plans and a large selection of administrative papers was placed inside the cornerstone. To be certain, this was tradition. On the other hand, one may have also been worried that future Ottawa councils may forget how to actually have necessarily civic infrastructure constructed in a timely manner, so an archive of the process was a good idea.56”Lay Cornerstone For New Police Building,” Ottawa Journal, May 24, 1956, p. 2. Construction continues. July 27, 1956. Image: City of Ottawa Archives CA039721. Construction continues. September 4, 1956. Image: City of Ottawa Archives CA040312. Construction continues. September 9, 1956. Image: City of Ottawa Archives CA040592. Construction continues. October 11, 1956. Image: City of Ottawa Archives CA040052. Construction continues. November 3, 1956. Image: City of Ottawa Archives CA041519. Construction continues. December 3, 1956. Image: City of Ottawa Archives CA042098. Once the ceremonial trowels were put away and dignitaries back behind their desks, construction of the new police station continued. Unsurprisingly, it was unable to continue without a series of budget overages. In March, the Board of Control was irritated to find that the project required an additional $9,500 for what were felt to be “extras” on a project that had already come in $60,000 above the $1 million budget.57”Board ‘Blows Its Top’ Over ‘Extras’ For Police Station,” Ottawa Citizen, March 6, 1957, pp. 1, 3. When all was said and done, the total budget came in at $1,300,000.58”New Police Station Cost $1,300,000,” Ottawa Journal, April 10, 1957, p. 2. The budget was not, of course, the only thing to change: the name “Ottawa Courts and Constabulary Building”, which was never popular, was discarded in favour of “No. 1 Police Station”. That the former was chiseled into the cornerstone (see picture above) and to be affixed to the window box in bronze lettering was considered regrettable.59”Named New Building No. 1 Police Station,” Ottawa Journal, April 5, 1957, p. 15. As the new police station neared completion, excitement grew in the local press. Source: Ottawa Citizen, April 26, 1957, p. 18. In the later parts of the Spring, as construction neared completion, the level of excitement – at least in the local press and among civic officials – grew considerably.60”City’s New Police Station Modern In Every Direction,” Ottawa Citizen, April 26, 1957, p. 18. Although police had begun to move into the new building in June, an official opening was scheduled for July 3.61”New Police Station Opening July 3,” Ottawa Journal, May 29, 1957, p. 1. Like all good projects, there were bugs, or in this case rats to iron out. Source: Ottawa Journal, June 22, 1957, p. 1. One would be hard pressed to find any large project that is not faced with problems of varying sizes and types. In the case of Ottawa’s new police station, there was one new and one that was entirely too familiar. The Journal’s Brian Magner outlined some of the expected issues in dealing with a new building: air conditioning that did not yet work, official and prisoner alike not knowing their way around the new building, being unaccustomed to the new phone system, and not yet knowing where keys and records were being kept.62Brian Magner. “Even the Detectives Lost In the New Police Station,” Ottawa Journal, June 17, 1957, p. 1. A more familiar issue reared its head when it seemed that the rats of old station on Queen63Which was scheduled to be demolished in time for the Queen’s 1957 visit. See “Will Level Police Station For Tour,” Ottawa Citizen, August 27, 1957, p. 3 got lonely and found their way en masse to the new building!64”Rats Invade Ottawa’s New Police Station,” Ottawa Journal, June 22, 1957, p. 1. The Citizen appears to have been content to report in a more subdued and traditional style, focusing less on what had been going wrong.65Ottawa Citizen, June 26, 1957, p. 40. The ribbon was cut by Attorney General Kelso Roberts in a small and relatively subdued ceremony. There was certainly work to get to.66”Attorney General Opens New Police Building, Lauds Force,” Ottawa Journal, July 4, 1957, p. 19. What’s old is new again. Source: Ottawa Journal, November 2, 1965, p. 3. While the Modernist style of architecture may have been a deliberate attempt to break from the past, that was probably about the limit. Not even a decade after it opened, the force was pressed for space. Window sills were doing double-duty as desks, training rooms as court rooms, and even some parts of the jail were commandeered for office space. Expansions were planned and built, but none of it seems to have alleviated the pressures. A growing city begat a growing police force and Ottawa in the postwar era was running high.67”Police Building ‘Jammed’,” Ottawa Journal, November 2, 1965, p. 3. The sheen had quickly worn off the new police building. Seen here in April 1968, the building quickly became inadequate for its use. Image: R. Landry / CMHC 1968-285. By 1974, it had become nearly unbearable. With estimates running at $2,000,000 for a complete renovation, the City opted for a comparably modest $285,000 renovation that would serve to lengthen the time left in what was considered to be a “rundown building.” A complete renovation in that light did not seem to be worth the cost and that if millions were being considered, then a whole new headquarters should be considered instead.68”Controllers back police HQ revamp,” Ottawa Journal, March 27, 1974, p. 16. A facility had had been open for less than twenty years had already come to be considered “rundown” and too old to bother with renovations. As time progressed, it appeared to be more likely that a new headquarters would be needed. 60 Waller was much to small for the city’s 800 officers and the prospect of hosting them in the numerous vacant office spaces around the city was unappetizing.69Sheila Brady. “City ‘thinking old’ in its pursuit of new office space,” Ottawa Journal, December 21, 1977, p. 53. With that, the cycle had been completed: Ottawa’s police force had repeated at least one part of what played out with the Queen street building by outgrowing it quicker than a toddler does their school clothes. Once the Board of Control returned from its Christmas break in 1979, it gave its go-ahead for a new police headquarters. Although a site had not yet been selected, it set aside $9.2 million to get the project started. The remaining $7.8 million of the $17 million project was to be released the following year.70Gord Lovelace. “Board okays new police HQ,” Ottawa Journal, January 9, 1979, p. 2. A tight budget the following year meant that the project would be delayed, though the force was anxious to leave the Waller street facility.71Don Whiteley. “New police HQ may be axed again,” Ottawa Journal, December 13, 1979, p. 2. For some controllers, some of the reluctance to extend the needed funding may have come down to some discomfort with what were understood as luxuries (or “extras”) for senior officers.72”Police boss ‘luxury’ bothering controller,” Ottawa Citizen, January 16, 1980, p. 3. It was also early in 1980 that some of the location studies had come to bear fruit. 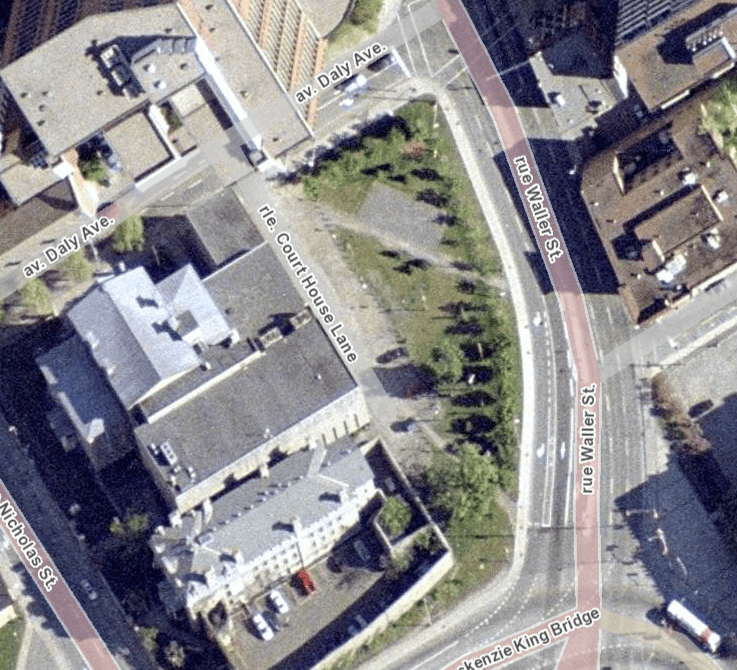 While there were a few considered, including along King Edward and adjacent to the RCMP off the Queensway, senior officers were unanimous in expressing a preference for a site at the corner of Elgin and Catherine streets. It was considered to be most accessible and best placed for a modern mobile police force.73Gord Lomer. “Cops planning a break-out from Waller Street building,” Ottawa Journal, January 21, 1980, p. 3. For Council’s part, discussions about the nature of the potential new police headquarters seem to have been acrimonious. Mayor Marion Dewar was more concerned with higher-level considerations, while a number of deficit-sensitive councillors expressed dismay that their questions were consistently interpreted as being anti-police.74Ed Owen. “Report calls for police changes,” Ottawa Journal, January 30, 1980, p. 5. The preferred site, while owned by Ramada, was not being used for much more than a parking lot. Image: Gord Larsen / Ottawa Journal, May 23, 1980, p. 4. As part of the first phase, the firm of Bemi, Pye, and Richards was hired for the building’s design. Of the sites under consideration, the firm’s own analysis was consistent with the preference of senior officers: Elgin and Catherine. The one issue with the site was that it was owned by Ramada Hotels, so it would have to be purchased.75Donna Balkan. “Catherine St. site tops police HQ list,” Ottawa Citizen, February 21, 1980, p. 1. While the project was making progress where possible, Chief Tom Welsh expressed frustration at the inability of Council to arrive at a decision on the file.76Ed Owen. “HQ delay unacceptable, police say,” Ottawa Journal, May 8, 1980, p. 3. The Catherine street location was settled on at the end of May, allowing the project to proceed in earnest.77Tom Spears. “Police facing long wait until move to new home,” Ottawa Journal, May 23, 1980, p. 4. There was some brief discussion that the new headquarters would be spread over two lots, the Ramada property and Beaver Barracks78Ed Owen. 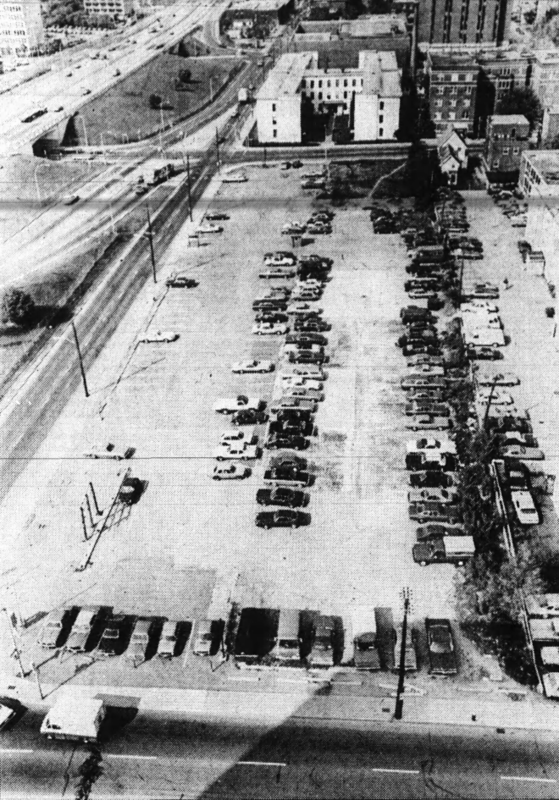 “Gov’t prefers land swap for Beaver Barracks site,” Ottawa Journal, May 28, 1980, p. 3., though it was later decided to keep it confined to the Ramada block.79Tom Spears. “New police building to be on single lot,” Ottawa Journal, June 16, 1980, p. 5. The project was expected to take at least two years to complete.80Ibid, Spears, May 23. The Elgin Street headquarters in May 2016. Image: Google Maps. The new building was finished and ready for move-in by early 1983. On May 16, Beth Burgess of the Citizen reported that the move went smoothly on the whole, though the few things that went wrong were somewhat familiar, albeit minor. Few yet knew their way around the new compound-like facility, some phone numbers were published incorrectly, and everything was in boxes, making some necessaries difficult to locate. That the final cost of the new headquarters had come in at $21.5 million (rather than the $17 million first envisioned) does not seem to have aroused as much of Council’s ire as the comparatively small overage did in 1956.81Beth Burgess. “Ottawa police handle move with only minor irritations,” Ottawa Citizen, May 16, 1983, p. 2. 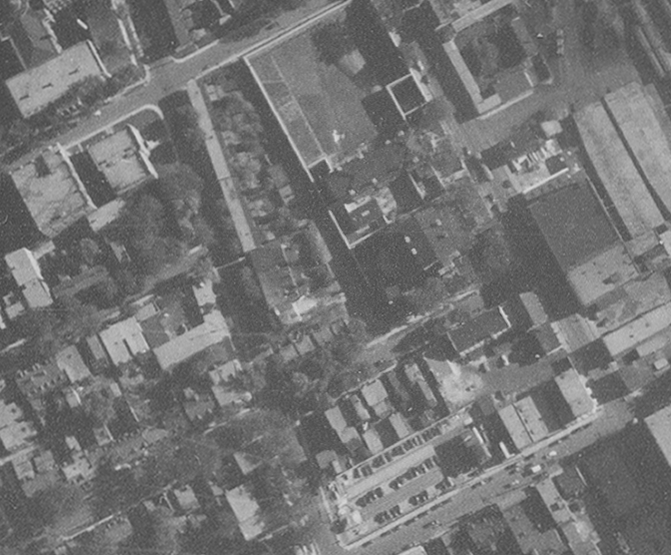 There were no plans made for what would become of the old headquarters at 60 Waller, though a land swap with the Department of National Defence for Beaver Barracks was contemplated.82Ibid, Owen. Once the building was emptied, both Ottawa and the Region found themselves at a loss over what the building could be used for. Somewhat unpleasantly and probably out of some necessity, the basement and first two floors were used as an emergency shelter for women and children through the end of the 1980s. Once better facilities for a shelter were secured, the building was left empty, costing the city $87,000 annually just to keep it standing.83Ron Eade. “A decade of dithering: costs mount as former Ottawa police station sits empty,” Ottawa Citizen, September 11, 1993, p. C1. The police moved into its new headquarters in 1983. 60 Waller, seen here in 1991, had gone largely unused and certainly unloved. Image: geoOttawa. That the building is much unloved is unsurprising. The style never was blessed with the sort of widespread public love that older, more ornamented styles were and so defenders have tended to be few and far between. Perhaps the midcentury sensibility is one that only an architect can love and it was precisely an architect that lodged the first argument to preserve. On April 20, 1991, the Citizen ran a column written by Mark Glassford which argued both for the preservation of Dickinson’s police station and that buildings in the modern style should absolutely be considered worthy of heritage protection. Glassford was not the only architect to argue for its preservation, local architects Robin Fyfe and William Metz worked to develop a proposal to refurbish it.84Mark Glassford. “Old police station is ‘modern’ heritage,” Ottawa Citizen, April 20, 1991, p. J6. As I note at the beginning of this story, much of the argument focused on it being designed by Peter Dickinson. When an argument to designate the building was brought before city council in 1993, it was met with a chilly reception. Along with Louise Coates, then president of Heritage Ottawa, Councillor Richard Cannings argued that the style was legitimate and worthy of consideration. Councillor Peter Hume remained unconvinced, and exclaimed that “there is no way you can justify to me that a 37-year-old police station is a heritage building. It’s another office box that doesn’t deserve to be saved.” Jim Watson, then a councillor concluded that “we’re at the point where we have to cut loose and make a decision. We don’t have the money to put into a project, and putting money in to maintain a building is a waste.” The local councillor, Nancy Mitchell, believed that it could be saved. The argument to demolish would remain moot for the moment: the city’s heritage committee was in the process of studying its heritage value more closely.85Ron Eade. “A decade of dithering: costs mount as former Ottawa police station sits empty,” Ottawa Citizen, September 11, 1993, p. C1. For a city that had, in recent memory, come through battles over the Daly Building, Aberdeen Pavilion (Cattle Castle), and even the Ottawa Normal School, there was some suggestion that there was some heritage battle fatigue and it appeared unlikely that a modern building would be able to arouse the same sentiments as the former three. Although she did not really appreciate the style herself, the Citizen’s Susan Riley made an attempt to grapple with the arguments offered by the proponents of its preservation. While arguments based on its architectural style did not resonate, more ecological arguments of reuse did.86Susan Riley. “Community can find use for old station,” Ottawa Citizen, September 14, 1993, p. B1. By the Fall, Jim Watson attempted to have the building sold quickly and with no public debate, but the motion failed and one was scheduled for October 27.87”Ottawa council ponders fate of ‘heritage’ building,” Ottawa Citizen, October 14, 1993, p. B2. The debate failed to result in a quick sale and its designation, which passed the heritage committee was placed before the planning committee on November 24.88”Former station favored as heritage site,” Ottawa Citizen, November 24, 1993, p. B1. The building is a blob. It makes Regina airport look exciting. Why not designate Westgate shopping centre? Let’s designate Tunney’s Pasture.”89Patrick Dare. “Restore or raze?” Ottawa Citizen, November 27, 1993, p. B1. The building definitely had some enemies. Carlingwood-Westboro Councillor Mark Maloney spared no effort in lining up choice invective against the style. That the planning committee has also just voted to give it heritage preservation only resulted in additional anger on Council. Councillor Diane Holmes was more even-handed, though feared that it would turn into another of the fights Susan Riley outlined above. A number of other councillors lined up with Maloney. A befuddled Peter Hume dismissed the “ugly concrete blob.” Jill Brown, who had felt the heritage movement went far enough suggested that the city “bomb it” and Peter Harris was less violent in his imagery and argued for its demolition. Nevertheless, while many councillors were either skeptical or opposed to considering the preservation of any modern buildings, the city’s Local Architectural Conservation Advisory Committee developed a considerable list of buildings to study for preservation.90Patrick Dare. “Restore or raze?” Ottawa Citizen, November 27, 1993, p. B1. In the same issue of the Citizen, Rhys Phillips penned an impassioned 1100 word argument in favour of its preservation that not only relied on it being a Peter Dickinson design, but on the merits of its design.91Rhys Phillips. “Old police station deserves new lease on life,” Ottawa Citizen, November 27, 1993, p. B2. As impassioned as the arguments and pleas were to preserve, there wasn’t a snowball’s chance in Hell that it was going to happen. Image: geoOttawa. On December 2, by a margin of 9-5, voted to reject the recommendation to grant the old police station with heritage status. A passionate Richard Cannings found himself ejected from the council chambers for continually interrupting Mark Maloney, whose barbs had become increasingly sharp. Council stopped short of voting in favour of demolition at that point and simply left it at a recommendation.92Carrie Buchanan. “Council rejects heritage status for former police HQ,” Ottawa Citizen, December 2, 1993, p. B1. Two weeks later, Council voted to demolish the building. The Citizen’s Sean Upton reported that Council was eager to see the building demolished in no small part to ensure that the city would retain the property instead of being tempted to sell it to a developer. The property could be used, in turn, for that highest of all purposes: a parking lot. Revenues from the lot could help defray the costs of subsidizing the Ottawa Art Gallery.93Sean Upton. “Renovating Ottawa: Ex-police station to be razed,” Ottawa Citizen, December 15, 1993, p. C1. The demolition was completed in the Spring of 1994. The lot remained unbuilt upon for more than 20 years. Image: Google Maps. Demolition was put out to tender and its executioner was selected near the end of February 1994.94Philip Fine. “Deadline nears for Wallis House,” Ottawa Citizen, February 22, 1994, p. B1. For its own part, the Citizen’s editors used the signing of 60 Waller’s death warrant (somewhat fitting given its proximity to the Ottawa Jail’s gallows) to argue that the popular definition of “heritage” should be broadened to include more than Victorian. After all, there was a time when Victorian buildings weren’t well liked and it’s possible that Modernist gems would be appreciated in the future.95”Redefining heritage,” Ottawa Citizen, March 5, 1994, p. B6. 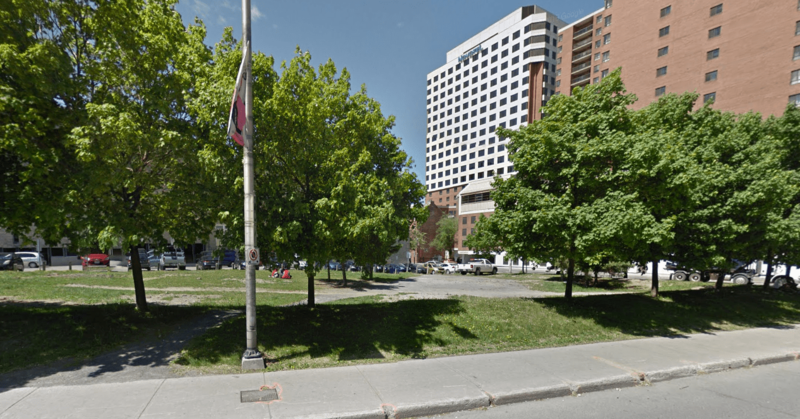 Although it is out of the scope of this story, it’s worth noting that after more than twenty years after the police station was demolished, the site will soon be home to a mixed-use development that includes the Arthaus Condominiums and Le Germain Hotel. Although it was not approved without considerable and spirited public debate, the development contains much of what proponents of the police station’s preservation had been looking for. Namely, space for the visual and performing arts. 1. ↥ Just as Dickinson did not. He died of cancer at 36. 2. ↥ ”The New Station,” Ottawa Journal, July 13, 1888, p. 4. 3. ↥ ”Miserable Headquarters,” Ottawa Journal, March 5, 1887, p. 1. 4. ↥ ”City and Vicinity,” Ottawa Journal, September 12, 1888, p. 4. 5. ↥ ”The New Police Station,” Ottawa Journal, June 20, 1889, p. 5. 6. ↥ ”Ottawa,” Canadian Architect and Builder 1, no. 11 (November 1888): 6-7. 7. ↥ In 1887, the Journal reported that most aldermen preferred to spend on road improvements. See “Miserable Headquarters,” Ottawa Journal, March 5, 1887, p. 1. 8. ↥ See Ottawa Journal, March 16, 1903, p. 9; Ottawa Journal, February 2, 1904, p. 6; “The Police Station Annex,” Ottawa Journal, May 13, 1904, p. 5; “Inspected New Station,” Ottawa Journal, January 31, 1905, p. 8. 9. ↥ ”New Station for Police: No Action Until System of Government is Definitely Decided,” Ottawa Journal, December 4, 1912, p. 3. 10. 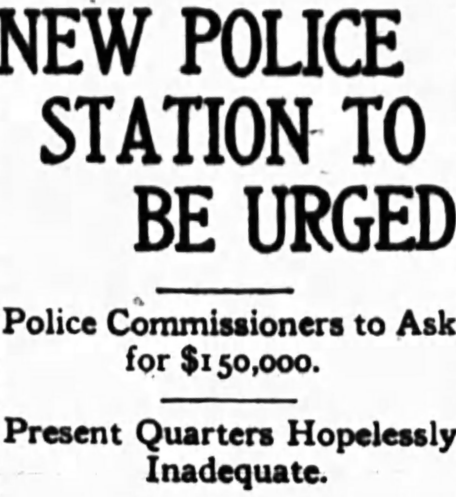 ↥ ”New Police Station To Be Urged,” Ottawa Journal, July 17, 1913, p. 1. 11. ↥ ”Proposed New Police Station,” Ottawa Journal, July 22, 1913, p. 6. 12. ↥ See Richard Pomfret. The Economic Development of Canada, Second Edition (Toronto: Nelson, 1993): 231-243; Kenneth Norrie, Douglas Owram, and J.C. Herbert Emery. A History of the Canadian Economy, Fourth Edition (Toronto: Thompson, 2008): 280-301. 13. ↥ ”New Municipal Center,” Ottawa Citizen, August 16, 1937, p. 24. 14. ↥ ”Chief Reports on Police Station,” Ottawa Citizen, February 25, 1938, p. 7. 15. ↥ ”Civic Delay Sometimes Costly,” Ottawa Citizen, February 26, 1938, p. 28. 16. ↥ ”Ratepayers Will Vote On New Police Station,” Ottawa Citizen, October 13, 1938, p. 18. 17. ↥ ”Ottawa Needs a New Police Station,” Ottawa Citizen, October 15, 1938, p. 17. 18. ↥ ”Ratepayers to Vote on Police Station Removal,” Ottawa Citizen, October 18, 1938, p. 16. 19. ↥ ”City Business Men Regret Defeat of Money Bills,” Ottawa Citizen, December 6, 1938, pp. 1, 4. 20. ↥ ”Mayor Lewis Tells of Jobs Planned for Post-War Era,” Ottawa Journal, November 22, 1944, p. 20. 21. ↥ See for example “Ottawa in 1919,” Ottawa Journal, November 17, 1944, p. 8. 22. ↥ ”Property Owners Approve Post-War Money Bylaws,” Ottawa Journal, December 5, 1944, p. 13. 23. ↥ ”May Build New Police Station At Sparks and Lyon Streets,” Ottawa Journal, June 13, 1945, p. 22. 24. ↥ ”A Short Step, But Still a Step Towards a New Police Station,” Ottawa Journal, June 14, 1945, p. 8. 25. ↥ ”Board Approves Sparks Street Site For New Police Station,” Ottawa Journal, August 22, 1945, p. 18. 26. ↥ ”Gov’t Sets Ottawa Federal District Area at 900 Square Miles,” Ottawa Journal, August 18, 1945, p. 13. 27. ↥ ”The New Police Station Must Not Be Held Up,” Ottawa Journal, August 31, 1945, p. 6. 28. ↥ ”Architects Appointed To Prepare Plans For City’s New Police Station,” Ottawa Citizen, November 24, 1945, p. 8; “Name Architects to Prepare Plans for New Police Station,” Ottawa Journal, November 28, 1945, p. 22. 29. ↥ ”Law Injustices Blamed for Housing Problems,” Ottawa Journal, December 8, 1945, p. 4. 30. ↥ ”Get on With The New Police Station,” Ottawa Journal, April 5, 1946, p. 4. 31. ↥ ”Get on With The New Police Station,” Ottawa Journal, April 5, 1946, p. 4. 32. ↥ ”New Police Station Wanted 33 Years Ago,” Ottawa Journal, February 21, 1947, p. 13. 33. ↥ ”Mayor Lewis Predicts Increase In Tax Rate,” Ottawa Citizen, January 7, 1947, p. 3. 34. ↥ ”Willing To Pay Fines To Get New Police Station,” Ottawa Citizen, April 10, 1947, p. 14. 35. ↥ Patricia Burt, Ibid. 36. ↥ ”New Police Station Site Undecided Mayor Tells Council,” Ottawa Journal, December 2, 1947, p. 3. 37. ↥ ”FDC Planners Go on Tour Of Rat-Ridden Police Station,” Ottawa Journal, November 17, 1952, p. 4. 38. ↥ Charlotte Whitton, Ibid. 39. ↥ ”Grand Jury Claims Police Station Unfit for Use,” Ottawa Journal, January 15, 1953, p. 34. 40. ↥ ”Ottawa’s Filthy Police Headquarters,” Ottawa Citizen, February 6, 1952, p. 34. 41. ↥ Ainslie Kerr. “Whitton Says Red Tape Blocks New Police Station for Ottawa,” Ottawa Journal, February 6, 1953, p. 1. 42. ↥ ”Police Cell Conditions Rapped After Prisoner Badly Beaten,” Ottawa Journal, March 9, 1953, p. 16. 43. ↥ ”Further Delay on City Hall,” Ottawa Citizen, April 9, 1953, p. 40. 44. ↥ This time, it was North Bay indignant Ottawans sniffed about. “What? 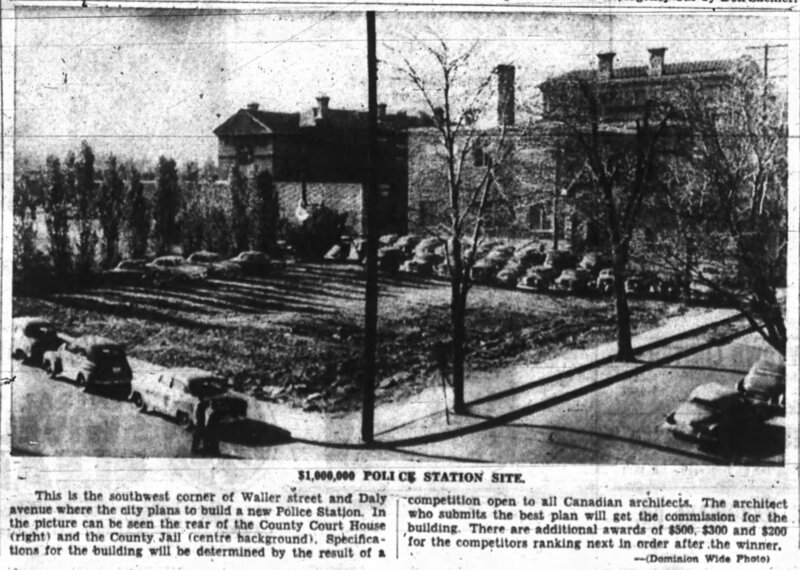 A New Police Station!” Ottawa Journal, August 21, 1953, p. 6. 45. ↥ ”Will Expropriate New Police Station Site,” Ottawa Citizen, December 22, 1953, p. 10. 46. ↥ ”Early Start Is Promised On New Police Building,” Ottawa Journal, April 14, 1954, p. 16. 47. ↥ ”There’s A Full House At The Police Station,” Ottawa Citizen, April 24, 1954, p. 3. 48. ↥ ”Expropriate Property For Station,” Ottawa Journal, May 7, 1954, p. 32; “Police Station Site Price $39,000,” Ottawa Journal, May 8, 1954, p. 3. 49. ↥ ”Police Headquarters Design,” Ottawa Citizen, May 12, 1954, p. 44. 50. ↥ ”Architects Show Keen Interest In Ottawa Police Building,” Ottawa Journal, November 2, 1954, p. 3. 51. ↥ Ottawa Journal, November 15, 1954, p. 26. 52. ↥ ”Ross Macdonald To Turn Police Station Sod,” Ottawa Journal, July 14, 1955, p. 1. 53. ↥ ”Fine Police Building Begun; City Offices Still in the Air,” Ottawa Journal, July 21, 1955, p. 6. 54. ↥ ”Hope To Finish Police Building By October 1,” Ottawa Journal, February 15, 1956, p. 40. 55. ↥ ”Lay Cornerstone New Police Building,” Ottawa Journal, May 24, 1956, pp. 1, 2. 56. ↥ ”Lay Cornerstone For New Police Building,” Ottawa Journal, May 24, 1956, p. 2. 57. ↥ ”Board ‘Blows Its Top’ Over ‘Extras’ For Police Station,” Ottawa Citizen, March 6, 1957, pp. 1, 3. 58. ↥ ”New Police Station Cost $1,300,000,” Ottawa Journal, April 10, 1957, p. 2. 59. ↥ ”Named New Building No. 1 Police Station,” Ottawa Journal, April 5, 1957, p. 15. 60. 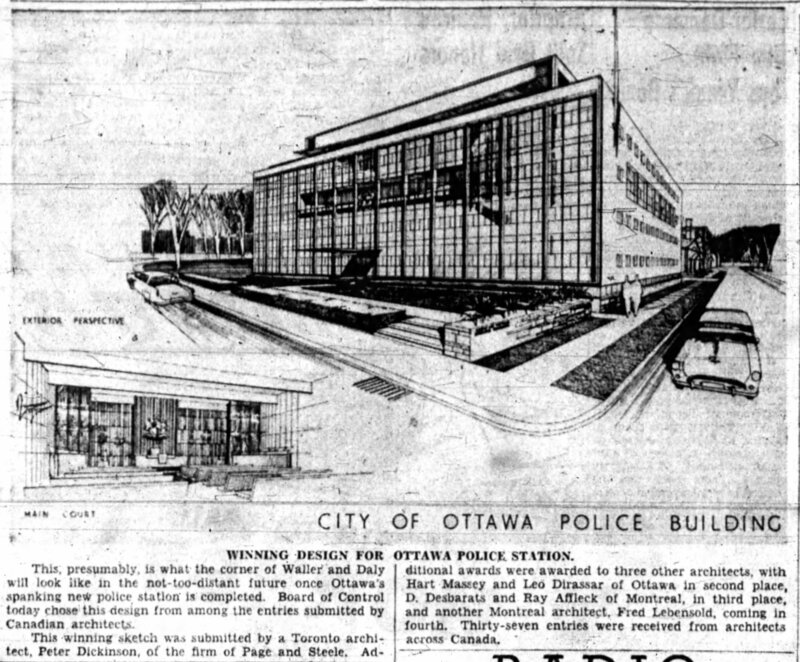 ↥ ”City’s New Police Station Modern In Every Direction,” Ottawa Citizen, April 26, 1957, p. 18. 61. ↥ ”New Police Station Opening July 3,” Ottawa Journal, May 29, 1957, p. 1. 62. ↥ Brian Magner. “Even the Detectives Lost In the New Police Station,” Ottawa Journal, June 17, 1957, p. 1. 64. 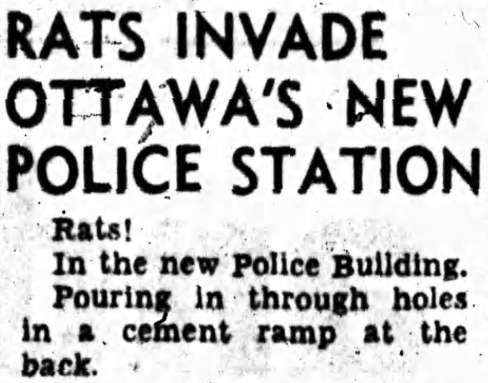 ↥ ”Rats Invade Ottawa’s New Police Station,” Ottawa Journal, June 22, 1957, p. 1. 65. ↥ Ottawa Citizen, June 26, 1957, p. 40. 66. ↥ ”Attorney General Opens New Police Building, Lauds Force,” Ottawa Journal, July 4, 1957, p. 19. 67. ↥ ”Police Building ‘Jammed’,” Ottawa Journal, November 2, 1965, p. 3. 68. ↥ ”Controllers back police HQ revamp,” Ottawa Journal, March 27, 1974, p. 16. 69. ↥ Sheila Brady. “City ‘thinking old’ in its pursuit of new office space,” Ottawa Journal, December 21, 1977, p. 53. 70. ↥ Gord Lovelace. “Board okays new police HQ,” Ottawa Journal, January 9, 1979, p. 2. 71. ↥ Don Whiteley. “New police HQ may be axed again,” Ottawa Journal, December 13, 1979, p. 2. 72. ↥ ”Police boss ‘luxury’ bothering controller,” Ottawa Citizen, January 16, 1980, p. 3. 73. ↥ Gord Lomer. “Cops planning a break-out from Waller Street building,” Ottawa Journal, January 21, 1980, p. 3. 74. ↥ Ed Owen. “Report calls for police changes,” Ottawa Journal, January 30, 1980, p. 5. 75. ↥ Donna Balkan. “Catherine St. site tops police HQ list,” Ottawa Citizen, February 21, 1980, p. 1. 76. ↥ Ed Owen. “HQ delay unacceptable, police say,” Ottawa Journal, May 8, 1980, p. 3. 77. ↥ Tom Spears. “Police facing long wait until move to new home,” Ottawa Journal, May 23, 1980, p. 4. 78. ↥ Ed Owen. “Gov’t prefers land swap for Beaver Barracks site,” Ottawa Journal, May 28, 1980, p. 3. 79. ↥ Tom Spears. “New police building to be on single lot,” Ottawa Journal, June 16, 1980, p. 5. 80. ↥ Ibid, Spears, May 23. 81. ↥ Beth Burgess. “Ottawa police handle move with only minor irritations,” Ottawa Citizen, May 16, 1983, p. 2. 83. ↥ Ron Eade. “A decade of dithering: costs mount as former Ottawa police station sits empty,” Ottawa Citizen, September 11, 1993, p. C1. 84. ↥ Mark Glassford. “Old police station is ‘modern’ heritage,” Ottawa Citizen, April 20, 1991, p. J6. 85. ↥ Ron Eade. “A decade of dithering: costs mount as former Ottawa police station sits empty,” Ottawa Citizen, September 11, 1993, p. C1. 86. ↥ Susan Riley. “Community can find use for old station,” Ottawa Citizen, September 14, 1993, p. B1. 87. ↥ ”Ottawa council ponders fate of ‘heritage’ building,” Ottawa Citizen, October 14, 1993, p. B2. 88. ↥ ”Former station favored as heritage site,” Ottawa Citizen, November 24, 1993, p. B1. 89. ↥ Patrick Dare. “Restore or raze?” Ottawa Citizen, November 27, 1993, p. B1. 90. ↥ Patrick Dare. “Restore or raze?” Ottawa Citizen, November 27, 1993, p. B1. 91. ↥ Rhys Phillips. “Old police station deserves new lease on life,” Ottawa Citizen, November 27, 1993, p. B2. 92. ↥ Carrie Buchanan. “Council rejects heritage status for former police HQ,” Ottawa Citizen, December 2, 1993, p. B1. 93. ↥ Sean Upton. “Renovating Ottawa: Ex-police station to be razed,” Ottawa Citizen, December 15, 1993, p. C1. 94. ↥ Philip Fine. “Deadline nears for Wallis House,” Ottawa Citizen, February 22, 1994, p. B1. 95. ↥ ”Redefining heritage,” Ottawa Citizen, March 5, 1994, p. B6. Quite a detailed story and now I can look at the station on Elgin and know how it came to be.